This is a beautiful and interesting Caterpillar. When young, it is translucent green with a black horn on its tail and a yellowish head. 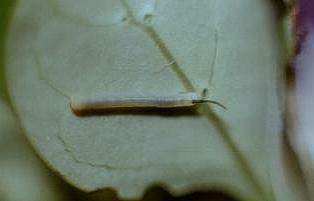 It rests lying along a vein on the underside of a leaf. Later, it becomes an opaque green with two yellow stripes running the length of its body. Its head, which is light blue, is only half the width of its body. The tail horn becomes blue and wicked-looking. The horn is in fact quite harmless. It may frighten predators or draw their attention from the less significant head end. When disturbed, the Caterpillar lashes its head violently from side to side. 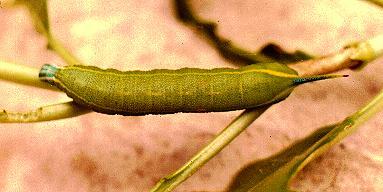 When mature, the caterpillar grows to a length of about 6 cms. 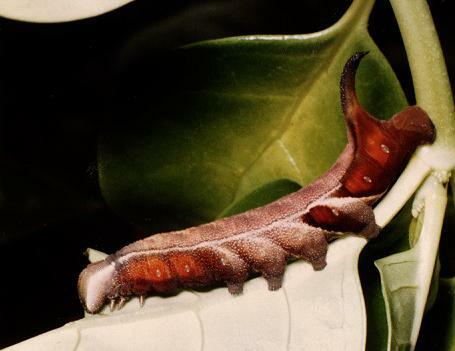 At its last moult, its coloration changes to diagonal patches of light and dark brown, which blend in well with the patches of light and shade on its food plant. 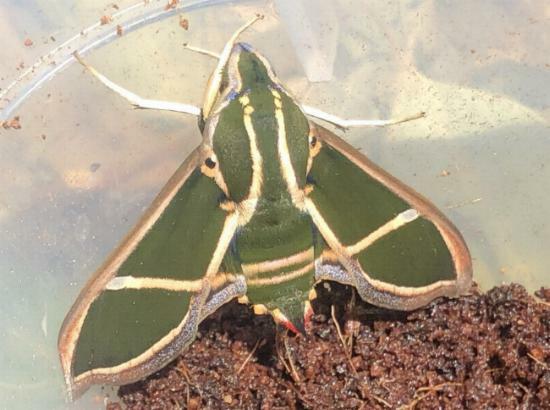 Uniquely amongst the SPHINGIDAE caterpillars, the diagonals slope downward and backward when viewed from the side. Ant Plant ( Myrmecodia beccari ). The caterpillars pupate on the surface of the soil under a mat of felt that they spin amongst dead leaves. Before pupating they wander around in their jar for a day or so. The pupa takes about four days to form. 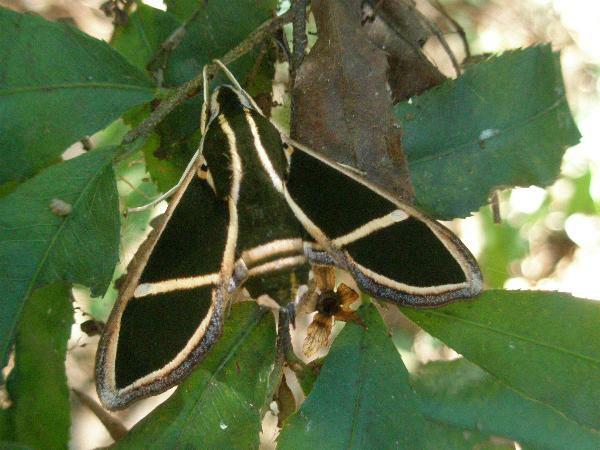 It has an exquisite pattern of light and dark brown markings corresponding to the organs of the maturing moth inside. Our specimens have taken from seven to thirteen weeks for metamorphosis. The moth itself is a handsome dark brown with a green sheen, with white edges to the wings and white bars across the wings and abdomen. It normally rests with these white bars aligned on each side to form a single stripe across the moth. 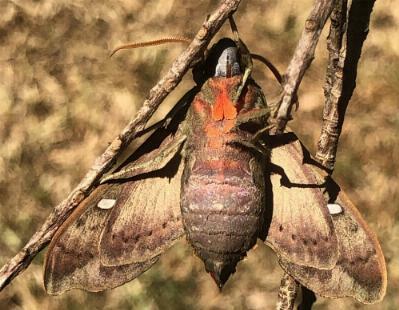 This may give effective camouflage, misleading the eye to see the front and back as separate entities, neither of which is especially shaped like a moth. There is a black dot in each of the white areas at the base of each wing, which look perhaps like eyes, and with the double bar across the abdomen looking like a mouth, make the moth look like a mean monster. The underside of the moth has tufts of bright red hair. Also the ends of the white bar show as transparent windows on the wings. The underside of the female has pink markings on the abdomen, and a pink tip to the abdomen. The male has yellow markings under the abdomen, and red on the tip of the abdomen. 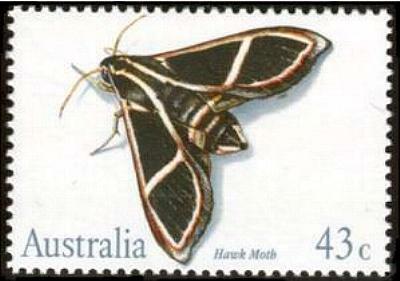 The male moths have a wingspan of about 5.5 cms. The female is larger with a wingspan of about 6.5 cms. 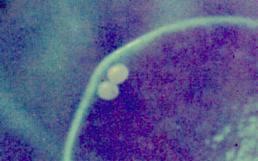 The eggs are smooth, white and oval, and have a diameter about 0.5 mm. They are laid singly or in pairs on the edge of a leaf of the foodplant. Collins Eyewitness Handbooks, Sydney 1992, p. 242. Melbourne University Press, 1990, pl. 16.12, p. 413. London : T. Bensley (1805), p. 3, and also Plate 2. Entomological Society of Victoria, 2008, pp. 28-31. LeapFrogOz, Kuranda, 2015, p. 197. CSIRO Publishing, 2007, p. 170.